Thank you to everyone who took our poll in the bid to win a full festival kit! We wanted to know what you couldn’t possibly live without while you’re at festivals in the UK. Assuming you have your tent and sleeping arrangements sorted, what would be your festival essential? What’s the top festival essential? So, people voted and made their choice. The most essential piece of festival kit is………… a toothbrush! Probably a very good choice all round, I reckon. 45% of the people who voted said they could not go to a festival without it. 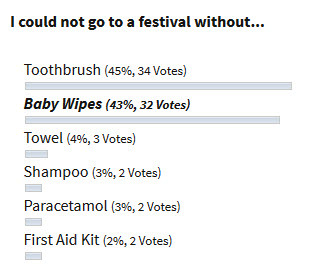 The toothbrush was closely followed by another popular essential – baby wipes – which snatched 43% of the votes. Surprisingly, just 2% of voters thought it essential to have a first aid kit. Thank you to everyone who answered the poll and entered the #CompleteSaving festival competition! The winner of the big bundle (2 man tent, 2 sleeping bags & mats, glow sticks & a mini survival kit) is Cydney! The four runners up, and winners of a mini survival kit each, are Jo, Jeremy, Catherine and Rachel. Congratulations to all! Related post: Quiz: Test Your Music Festival Knowledge! Join the fun @complete_saving – Complete Savings on Twitter!